Holly Drummond’s soft, soothing sound has been seen by some as “the female Damien Rice.” The 19-year-old Scottish singer-songwriter’s music varies from rich acoustic tracks to lighter and more lively electronic music, as well as a plethora of song covers. 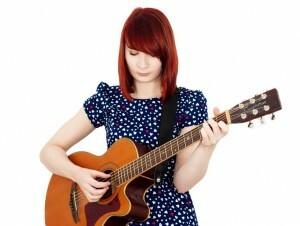 A cellist, guitarist, singer and casual pianist, Drummond has written songs for years, but did not share them with anyone she started her Youtube Channel four years ago. Since then, she has released three EPs, and is working on a new one, in addition to the re-recording of an old song that will be released as a free download. Her fourth album, “In The Dark -EP” is filled with emotionally-relateable music, with song themes ranging from love to life in general. One of the tracks, “These Four Walls” was written about a time when she felt stuck in life, not doing anything with her time, while “Cold Outside” tells a story of an old boyfriend in the wintertime. Much of Drummond’s music tells a story, often of something that happened to her– rarely are her songs fictional. While her favorite artists right now are Lucy Rose and Lorde, Drummond also draws inspiration from Ben Howard, Passenger, Paramore, Dido, Regina Spektor, The Pretty Reckless and Imogen Heap, to name a few. “I just hope (people) relate to my lyrics– that’s all you can hope for really,” Drummond said. For more Holly Drummond, like her on Facebook, follow her on Twitter @Holly_Drummond and check out her Bandcamp and Website.